Green! Many people make fun of vegetarians that "Ruffalo" just lettuce and trevolyatsi, but to say that I do not mind! Even in winter, when we light traditional stoves for traditional dishes such as all kinds of beans, lentils and chickpeas, I had a great desire to eat something green and fresh .. as you may have a salad to fresh snow falling outside. The good news is that just a little while and come fresh leafy season and did not even think of what a huge amount of salads can take time. 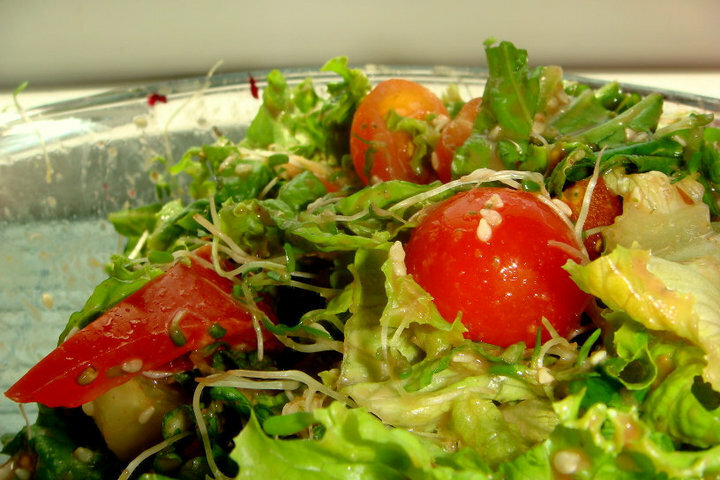 Interestingly in this salad that is very simple and easy dressing is sesame flavor and taste. Wash and chop vegetables. Sosa grind a blender for a minute as a pre-wash and sesame izkisnete. Bon Appetit! Didi, a question - I have a jar in the fridge with sesame many, many times. So, apparently, nothing he does not, can I use or has a shelf life?